If there is anything that I have learned about birding, it is to "expect the unexpected". When Darren Clark and Steve Butterworth set out for some Saturday morning birding at Camas NWR in eastern Idaho, they certainly could have expected to find some interesting birds and maybe even a vagrant eastern warbler, but who would have thought they would have discovered a first state record White-eyed Vireo?! And who better to photo-document a first state record than Darren who is a photography professor at Brigham Young University - Idaho (all photos here are his and are used with permission). 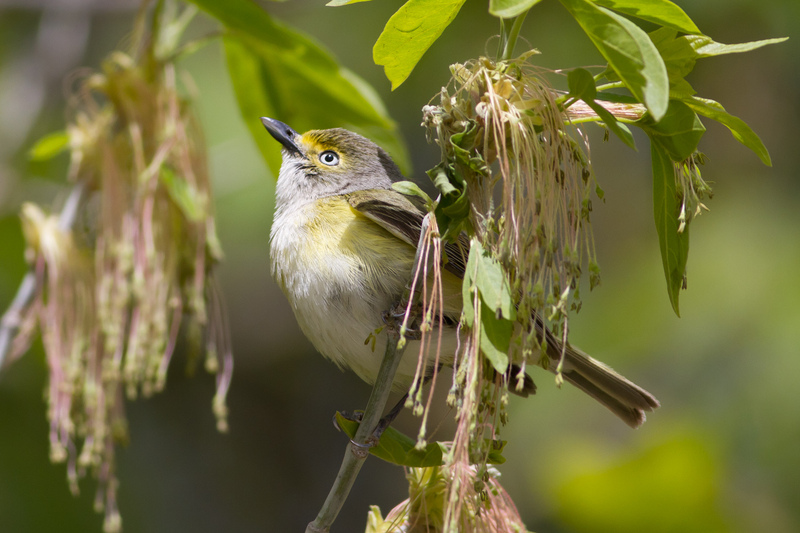 White-eyed Vireo is so unexpected in Idaho that it does not even appear on the checklist as a possibility. It's not even listed as a review species, but it certainly will be now! "Steve Butterworth and I birded Camas NWR (Jefferson County) today. It was pretty great. We started out birding the marsh. There were quite a few shorebirds in big pond (the first one heading south from headquarters). We had 4 Black-bellied Plovers, 4 Semipalmated Plovers, 3 Dunlin, 40-50 Least Sandpipers, 2 Western Sandpipers, 30 Long-billed Dowitchers, and 4 Lesser Yellowlegs, among others. We weren't able to relocate yesterday's Whimbrels. We then thought we'd halfheartedly check the trees for migrants. No good songbirds ever seem to show up at Camas until late May, but we thought we should check anyway. About a hundred yards up the dogleg (the road that heads north from headquarters along camas creek) we noticed a couple of Dusky Flycatchers. As we were looking them over a smaller little bird flew in the trees. We thought it was a Kinglet at first, but it had a lot more color on it. I thought I caught a white eye and I got really excited. I told Steve "I think that's a White-eyed Vireo". I snapped a couple of photos and it took off. 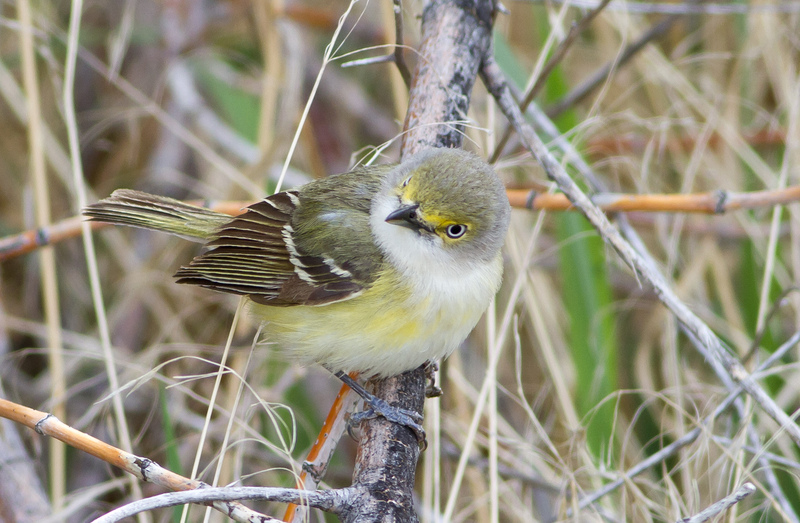 We couldn't relocate it at first, but when I enlarged the photos on my LCD I could clearly see we had found a White-eyed Vireo (first for Idaho I think). Anyway, we eventually re-found the bird and followed it around and tried to keep tabs on it until others could arrive. A few birders did arrive and all were able to see the bird. When we left, the bird was across from the observation deck on Camas Creek (near headquarters)." Steve and Darren, great sighting guys! For Idaho and for the intermountain west. Congratulations! Huge congrats Darren & Steve! Wow! What great photos too! That's why I like to leave discovering new state birds to the pros. That's awesome though, what an exciting development for Idaho birding. Get out there and see it Robert! Great sighting, and equally great photos. How exciting! This is outstanding! Wow, what a sighting! Beautiful bird! Superb photographs!